What a hot day it was!!! After trekking to 2 different locations before managing to find some food souvenirs, we went to Coffee on the Table opposite Ghee Hiang to hide from the sun. Our last cafe in Penang does 3D latte art (additional RM3) for their coffee and chocolate drinks, both hot and cold (additional RM1). We got ourselves a Iced Cafe Latte (RM14.90+ 10% service charge) and Iced Hazelnut Chocolate (RM16.90+). Pretty pricey 😮 But we were feeling too cui to go anywhere else. The coffee was way better than the chocolate. The hazelnut chocolate had a strange cloying artificial sweetness, and very little chocolate taste to it. At least the coffee tasted like what it was supposed to, haha. The free WiFi here was kinda spotty for a while, but was ok for the rest of our chillax session. 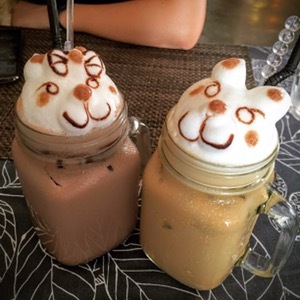 But we were most impressed with their 3D latte art which they could do it in iced drinks as well, something we have not been able to find in Singapore!